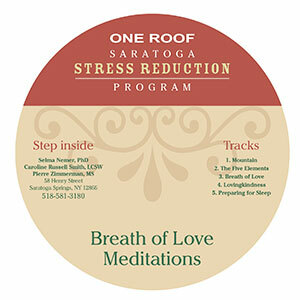 Sample the Saratoga Stress Reduction Program, or continue and deepen your practice as a Saratoga Stress Reduction Program Graduate with this CD of five meditations. Relax into a state of inner calm as our instructors gently guide you through meditations for inner strength, renewal and complete rest. Tracks include The Mountain, The Five Elements, The Breath of Love, Lovingkindness, and Preparing for Sleep. Listen to this CD as a great way to begin or end each day, giving yourself the gift of calm centeredness. Make an appointment for any of our services or workshops today. Larger group meditations, workshops, and classes at our expanded facility. An eight-week stress reduction and pain management course.